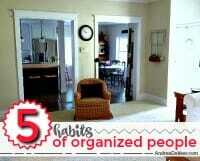 I’m often asked for my “secrets” to enjoying an organized home with little kids home with me all day long. 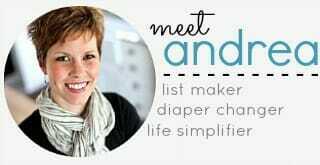 Unfortunately, I don’t have magical powers or a super special secret to share with you… just a few habits I’ve learned over the years that make it possible to keep my home neat and organized every day with minimal effort. It might not seem like much now, but these simple habits have completely transformed the way I live my life, and how I feel about my space. A clutter-free home and life is not always as simple as making a few wise choices… but I do think that if we get in the habit of making better choices on a regular basis, our efforts to declutter and simplify will be THAT much easier. 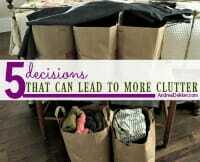 Today I’m sharing 5 decisions that could cause excess clutter in our homes… as well as a few better decisions to make instead. 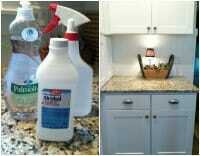 50 Things You Can Purge Right Now! 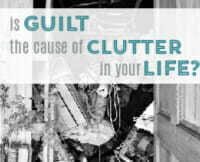 When it comes to clutter in our homes, the biggest stumbling block is often our own brains! We make it out to be this HUUUUUUGE issue, and instead of just getting started, we continually put it off because it just never seems like the “right” time. Sound familiar? If so, grab a trash bag and a donation box, read today’s post, and purge something RIGHT NOW! 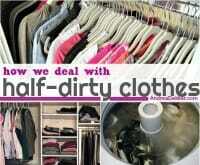 I’m still committed to “only” doing laundry twice a week (a system that’s been working really well for me for over 2 years), and since I don’t want to do 10 loads of laundry on those 2 days, I’ve come up with a few different methods of dealing with what I consider “half-dirty clothes” — clothes that have been worn but aren’t worthy of washing just yet! Now that the New Year is finally here, I’m happy to report that I did successfully purge every single room, closet, dresser, cabinet, and shelf in my home over the past 16 weeks. Honestly… I got rid of SO MUCH MORE than I thought I would, and I’m sharing the final update on the blog today! 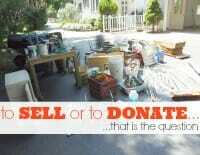 Over the past few years, I’ve talked a lot about selling our unneeded items. However, what I might not have said in so many words is that I most definitely do not SELL everything we purge. In fact, the majority of it is donated on a regular basis as I just want to get it out of our home ASAP! I’ve always been a perpetual purger as I know I MUST stay on top of the clutter to prevent it from spiraling out of control. Sometimes I do feel a little wasteful — purging, trashing, and recycling things so regularly; but I just don’t have the extra energy required to deal with so much stuff. If you’ve ever felt wasteful after a good purge, I think you’ll relate to this Reader Question. I KNOW there are more attractive and more professional ways of concealing cord clutter — but the simple method I’m sharing in today’s post was completely free AND it has worked well for us for 8 years now! 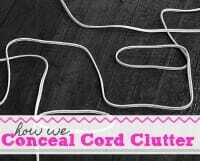 If you’re looking for a simple way to conceal your cord clutter, give our method a try! When it comes to simplifying and organizing your home, getting started is often the most difficult and seemingly overwhelming part of the entire project! If you’re looking for some relatively simple things you can start doing TODAY to help better organize your home and life, I promise the 3 tips in today’s post will most definitely get you moving in the right direction! Roughly 10 weeks ago, I shared a “fun” challenge here on the blog — the opportunity to complete a FULL HOUSE PURGE before the New Year even began! Since then, I’ve been diligently working through one room per week, and the results have paid off! I even surprised myself with the amount of stuff we purged! Wherever you are on your holiday shopping progress, you’re bound to have at least one person on your list that you JUST DON’T KNOW WHAT TO GIVE THEM! Right? 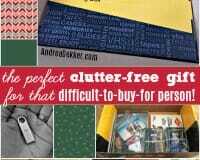 Today I’m sharing a fantastic (and clutter-free) gift idea for those difficult-to-buy-for people on your list this year! 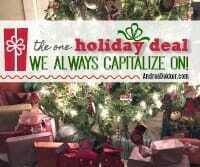 Also, I have a discount code!! While it would be fantastic if I could work individually with each one of you to help you clear the clutter from your home, the lack of hours in a day and my hatred of travel make that idea completely impossible. One way I can tailor my advice to each one of you, however, is to share open-ended questions YOU can ask YOURSELF when YOU purge YOUR home. By asking yourself these 9 questions (and honestly answering them) you will equip yourself with the ability to purge necessary items from your home and life! 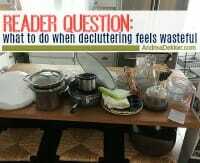 Could Clutter Cost You Your Home? A couple weeks ago, I took the older 3 kids to a local Fire Station open house — it was so much fun! The kids enjoyed all the goodies in their grab bags, and I learned quite a bit from reading through the packets of information handed out to parents. 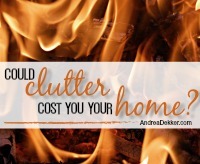 One article in particular caught my attention — about reducing the risk of fire by reducing the clutter in our homes. 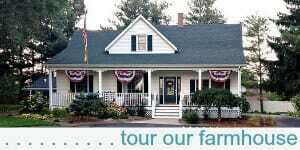 I’m sharing more in today’s post! Just over 5 weeks ago, I shared my plan to complete a full-house purge BEFORE the New Year, and since then, I’ve completed 5 rooms in our house. I’m sharing my progress in today’s post, as well as a little motivation and encouragement for those of you who are following along with my one-room-per-week plan (or for those of you who want to get started). 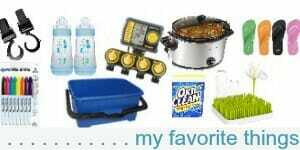 I realize every little individual cleaning or organizing task will not drastically improve the state of your home or instantly simplify your life… BUT OVER TIME, you will not only declutter, better organize, simplify, and clean your home; you’ll also develop the habits of utilizing your time efficiently and always looking to better your spaces (2 invaluable habits in my opinion). 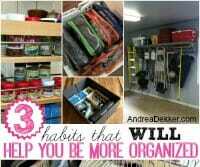 Read today’s post for 50 ways you can better organize your home and simplify your life in 10 minutes or less! !